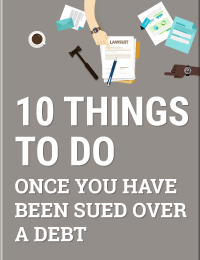 If you are being sued over a debt that you owe, why pay an attorney an hourly rate to fight a losing battle in court? Nor do we provide legal advice. We are Certified Debt Negotiation Specialists. There are certain circumstances in which you are being sued over a debt and it makes sense to hire an attorney, whether it is a bankruptcy attorney, a debt attorney, or a general attorney. For example, if you are sued over a debt that you do not owe, then hiring an attorney to litigate the matter in court makes perfect sense. Attorneys are great for litigating and protecting one’s legal rights, but they can be exceedingly costly. An attorney will generally require a retainer and then bill his or her hourly rate against the retainer. If an attorney spends any amount of time on your case, whether it’s a phone call, email, or drafting a motion, it is billed. Once the retainer is depleted, it must be replenished, whether the job is completed or not. In this case, it makes sense to hire an attorney to answer the lawsuit and to represent you in court. If you do not owe the debt, then there are certain defenses and legal arguments an attorney can raise during the litigation process in efforts to prove that the alleged debt is invalid. If you are being sued over a debt that you owe, why pay an attorney an hourly rate to fight a losing battle in court? If you owe the debt, Commercial Debt Reduction is a much more time and cost efficient way to solve the problem. Fuselier & Associates Financial focuses on cash flow management and financials in order to negotiate your debt directly with your creditors. We have the expertise and industry experience to help turn a losing situation into a more favorable outcome for our clients.